Posts about the semantic processing. In one of our previous posts we talked about Financial Compliance, FinTech and its relation to Text Analytics. We also showed the need for normalized facts for mining text in search of suspects of financial crimes and proposed the form SVO (subject, verb, object) to do so. Thus, we had defined clause as the string within the sentence capable to convey an autonomous fact. Finally, we had explained how to integrate with the Lemmatization, PoS and Parsing API in order to get a fully syntactic and semantic enriched JSON-formatted tree for input text, from which we will work extracting SVO clauses. In this post, we are going to continue with the extraction process, seeing in detail how to work to extract those clauses from the response returned by the Parsing API. What is Financial Compliance and what is FinTech? Financial crime has increasingly become of concern to governments throughout the world. The emergence of vast regulatory environments furthered the degree of compliance expected even from other non-governmental organizations that conduct financial transactions with consumers, including credit card companies, banks, credit unions, payday loan companies, and mortgage companies. Technology has helped financial services address the increased burden of compliance in innovative ways which have also yielded other benefits, including improved decision-making, better risk management, and an enhanced user experience for the consumer or investor. The rapid development and employment of AI (Artificial Intelligence) techniques within this specific domain have the potential to transform the financial services industry. FinTech (Financial Technology) solutions have recently arised as the new applications, processes, products, or business models in the financial services industry, composed of one or more complementary financial services and provided as an end-to-end process via the Internet. You can find additional interesting information in this article. At MeaningCloud, we are proud to sponsor the Eye for Pharma Conference. Data, Evidence and Access Summit 2017. November 13-14th, 2017 – Philadelphia, US. MeaningCloud’s value proposition for the conference can be summarized as Text-Based Information with Artificial Intelligence. Eye for Pharma is about demonstrating and communicating value, no matter which department you’re in. Whether it’s exploring innovative uses of real-world evidence (RWE) or creating new outcomes-based pricing models, only by embracing the power of data can you fully unlock the value of your drugs. It is a great opportunity for learning and networking. 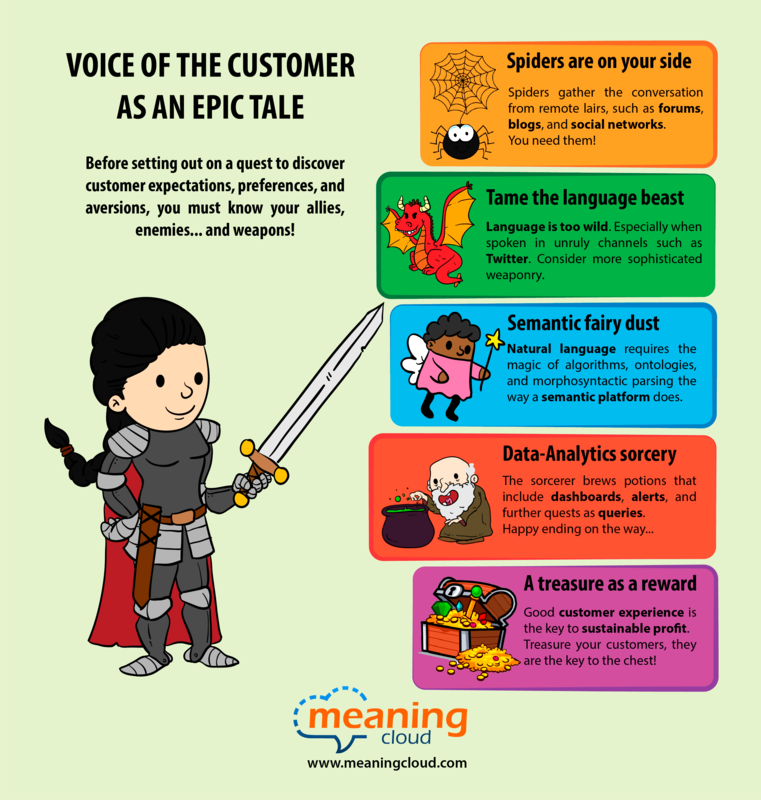 Getting meaningful insights from natural language is no easy task. Text analytics value and accuracy grow as we add different layers of resources to the procedure. 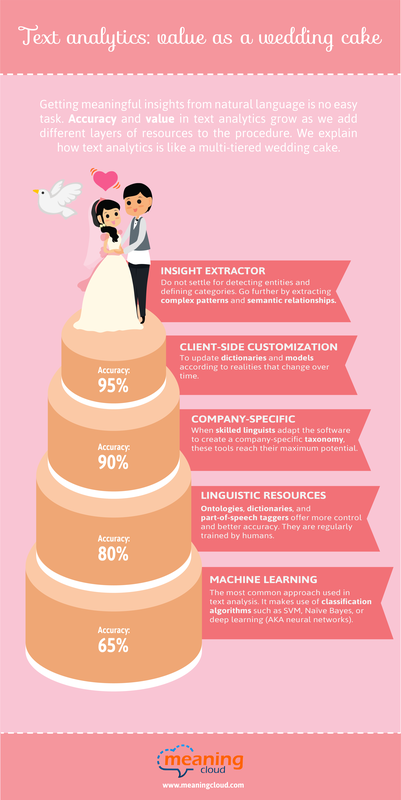 We explain how text analytics is like a multi-tiered wedding cake. Before setting out on a quest to discover customer expectations, preferences, and aversions, you must know your allies, enemies, and weapons. For insurance companies, it is vital to listen and understand the feedback that their current and potential customers express through all kinds of channels and touch points. All this valuable information is known as the Voice of the Customer. By the way, we had already dedicated a blog post to Text mining in the Insurance industry. (This post is a based upon the presentation given by Meaning Cloud at the First Congress of Big Data in the Spanish Insurance Industry organized by ICEA. We have embedded our PPT below). More and more insurance companies have come to realize that, as achieving product differentiation at the industry is not easy at all, succeeding takes getting satisfied customers. Listening, understanding and acting on what customers are telling us about their experience with our company is directly related to improving the user experience and, as a result, the profitability. In the post on Voice of the Customer and NPS, we saw in more detail this correlation between customer experience and benefits. In the last decade, sentiment analysis (SA), also known as opinion mining, has attracted an increasing interest. It is a hard challenge for language technologies, and achieving good results is much more difficult than some people think. The task of automatically classifying a text written in a natural language into a positive or negative feeling, opinion or subjectivity (Pang and Lee, 2008), is sometimes so complicated that even different human annotators disagree on the classification to be assigned to a given text. Personal interpretation by an individual is different from others, and this is also affected by cultural factors and each person’s experience. And the shorter the text, and the worse written, the more difficult the task becomes, as in the case of messages on social networks like Twitter or Facebook.